When Silhillians reached half time with a commanding 27-10 lead, it left OLs with an uphill struggle to get anything out of this game, writes Bill Wallis. Then, when Sils added to their lead after a couple of minutes of the second half to increase the margin to 32-10, OLs appeared to have been sunk without trace. Instead a remarkable second-half transformation saw OLs score an unanswered 27 points to claim the win points and a try bonus. Jon Bean narrowed the margin with a penalty before OL’s best spell of the half saw a 60-metre run deep into Sils’ territory by Greg Loydall, only halted just metres from the line. Then Ben Anderson popped up again to feed James Collins, the scrum half left with a lot to do before touching down under the posts. Bean converted the try and OLs had a 10-8 lead. But Silhillians took control of the game in the second quarter. Their pack had OLs’ eight under pressure in the set pieces, their backs were operating with some purpose and OLs were looking ragged and disorganised by comparison. Twice in the space of five minutes, Sils’ fly half put deft, slide-rule kicks in behind OLs’ defence and twice they resulted in well taken tries, OLs’ back field defence all at sea. Both were converted to push Sils out to a 22-10 lead, which was increased further with a penalty on the stroke of half time. 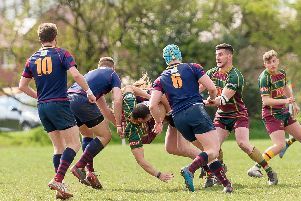 Matters got worse for OLs a few minutes after the break when Sils scrum half splintered their defence in a powerful run that took him over the line, the conversion increasing their advantage to 32-10; and OLs’ fly half Bean had limped off with a knee injury. Suddenly it appeared that a switch had been thrown somewhere as OLs decided enough was enough and started to take the game to their opponents. Fresh legs had appeared in the shape of replacement props Chris le Poidevin and John Barratt and OLs were now going forward. After a spell of sustained pressure on Sils’ line, Loydall tapped a quick penalty and fed Ben Scott coming inside at pace from his wing to go over under the posts, Loydall improving the try. Five minutes later flanker Paul Lewis finished off another prolonged attack to barrel over, Loydall’s conversion attempt just faded wide but OLs had now reduced the deficit too 22-32. This was followed shortly by another Scott try, due reward for an all action display by the wing, capitalising on some robust approach work with le Poidevin again prominent. Loydall added the goal points and suddenly it was anybody’s game at 29-32. Sils had lost a man to a yellow card, but OLs beat that when they lost two to the bin. Sils re-grouped and were now keeping the ball in their pack to cash in on their numerical advantage. But they conceded a penalty some 45 metres out and a superb kick from Loydall sailed over the bar to level affairs at 32-32 with ten minutes to play. Luke Townsend looked odds on to give OLs the lead with a long sprint down the touchline but Sils’ inside centre just got across to charge him into touch. Then, after Sils had pushed OLs back into their 22, Loydall put in a long, searching kick some 40 metres down the line, Scott got up to scrag the catcher and quick possession gave Jordan Bunn the chance to get over in the corner. The conversion missed but OLs now held the lead at 37-32 and they had scored the 8 points that won the game with just 13 men on the field. OLs’ were back to 15 just as the game entered added time at the end, and just as well, as Sils besieged their line in a last-ditch attempt to regain the lead, but OLs held firm and had secured a memorable win that had seemed a remote possibility at half time. On Saturday OLs entertain Lincoln in the Midlands Quarter Final of the RFU Intermediate Cup, the first visit to Fenley Field by the visitors in some 20 years. Kick off will be at the earlier time of 2pm.